Documentary music is something that’s interested me ever since hearing Steve Reich’s Different Trains for the first time in the early 90’s, and for me that work is still the high point of the genre. Reich masterfully combines train, siren, and vocal samples with string quartet writing emulating their pitches and rhythms, never losing sight of the overall musicality of the piece even as he allows the documentary material to shape his compositional process. After taking a first stab at an approach to sonifying the history of Mars exploration which treated each month as a separate beat, I got curious about what it would sound like to quantize the data at a coarser level—the year. I knew that following that approach would yield a much shorter piece filled with distinct chords, each of which would represent all of the launches from a single year simultaneously, yielding a different set of creative opportunities. I dropped the programmatic approach to harmony I took in my first attempt, and adopted a more expressive method, feeling my way through the narrative of Mars exploration, its highs and lows. At around the same time I got the idea to pair the music with text summarizing the outcome of each mission, in many cases condensed from the text of the official NASA timeline itself. This turned the timeline into a kind of poem, in which each line correlated with a note in the music. The piece starts with three indistinct chords, representing the first tentative attempts—all ostensible failures but still resulting in valuable learning and experience. Then, another three chords, louder and more directed in their movement, culminating in a high interval matching the first two successful Mars landings in 1975. Next come two low steps representing not only several unsuccessful missions, but also the long gap of time between those efforts and the beginning of what would grow into a golden age of Mars exploration. As we enter the next series of launches, the proportion of successful missions grows by leaps and bounds, and we begin to get melodic phrases (including a partial quote of John Williams’ theme from Close Encounters, a film which my time at Vandenberg Air Force Base was reminding me of at every turn), rising to a single note marking the launch of the InSight mission. I like the idea of adding to this composition as future Mars missions are launched, but that last note begs the question of how to go about adding new notes, since the existing piece is so clearly aimed at treating the InSight launch as its climax. When I add a new note for a new mission, should I keep that previous note the same? Or alter it so the new note is now the high point of the piece? At the moment, my gut tells me I should leave the earlier notes unchanged, building a new phrases instead of trying to always treat the latest mission as the melodic culmination of all that came before. 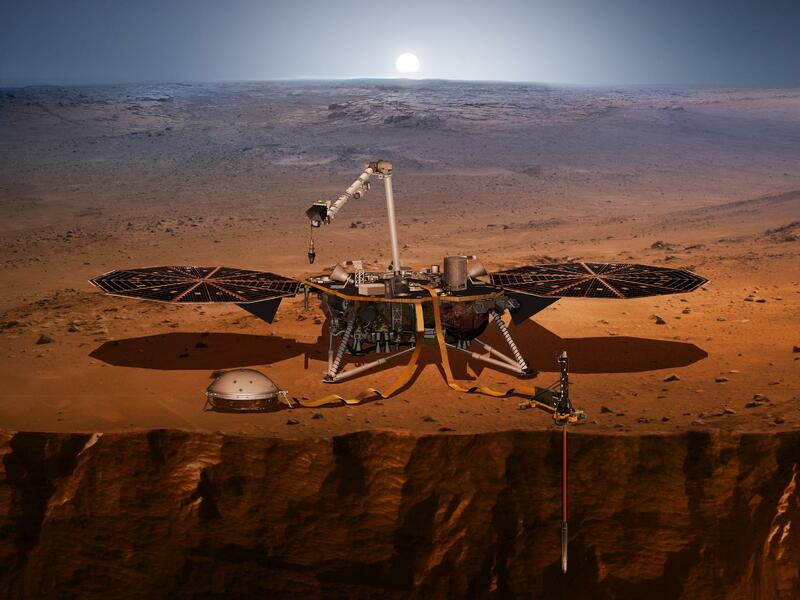 Another question: if the InSight launch had failed, would I have felt the need to go back and alter that last note to reflect the disappointing outcome? Again, I think not. Keep the note the same, and let it resonate with the text which would have to be added describing the actual outcome. Let the piece be true to the moment in which it was created—avoid revisionist compositional history. If you’d like to try your hand at performing this piece, I’ve put together sheet music which you can find below. Many thanks to NASA Social for this opportunity. Two of my biggest interests—music and space—collided happily with the opportunity to join the official NASA Social media team covering the launch of the InSight mission, humanity’s latest robotic envoy to Mars. I think it’s going to take years for me to fully process just how rare this opportunity was, much of it occasioned by the fact that this was the very first interplanetary launch from the US West Coast at Vandenberg Air Force Base, only a few hours from where I live. Fortuitously, the news of my selection actually arrived on the same day I found out that my rhythmic storytelling tool Stepworks was a Webby Honoree (a very good day indeed!) and so, as I had pitched to the NASA Social team in my application, I immediately set about thinking how I could use Stepworks to compose a unique “micromusical” piece relating to the launch. As I started poring through the official information made available about the mission by NASA, one of the things that jumped out at me immediately was a timeline of Mars exploration. Timelines are interesting to me compositionally because they are essentially data-driven stories which easily lend themselves to musical interpretation. The simple fact that only 40% of Mars missions have succeeded immediately brings home the often-repeated aphorism “space is hard,” and as a narrative I wanted the piece to reflect the challenges of space travel from an species-level perspective, superseding the nationalistic Cold War vantage point that kicked off the space race. My first task was to get a sense of the narrative “shape” of the data I was working with (akin to a “spotting session” when scoring a film). I immediately noticed a clear “every other year” pattern evident in the groups of mission dates: 1960-1962-1964, 1969-1971-1973-1975, etc. At first I thought this rhythm was simply a result of the amount of time it took to prepare the missions, but after my time at Vandenberg my understanding is that it was primarily an expression of the orbital mechanics of Mars and Earth, as optimal launch windows between the two planets only arise every 26 months. As a result, the underlying meter of the piece is actually conditioned by the movements of the planets themselves—a wonderful thought. Initially I began “sonifying” the launch timeline using months as my basic rhythmic unit not only to determine when notes would begin, but also when they would end, based on the relative duration of the missions. As mission success rates increased over time, I knew this would have the effect of “filling out” the piece with additional sustained notes, hopefully giving a nice build. Using months as the rhythmic basis had a profound impact on the piece, making it very sparse rhythmically (though still conforming roughly to the 26 month launch window cycle). To increase energy, I added a “monthly” pulse in the bass, with accents in January and July (the first and seventh beats), giving a 6/8 meter to the piece as a whole, set at a high 200 bpm tempo. Harmonically, I took a programmatic approach, using A as the root with each contemporaneous mission coming moving up a third in the natural minor scale (with a few exceptions in octave placement as the missions started to pile up). As the monthly pulse sounded continuously on A, any launch occurring while no other Mars missions were active would be played on C (up a minor third). If yet another launch occurred while the first mission was still running, it would be represented by an E (up a major third), the next by a G, and so on. If, however, all missions ended before the next launch began, that next launch would drop back down to the original C. This also had the effect of building the harmonic range of the piece over time from unisons, to minor third intervals, to minor third triads, then on to sevenths, ninths, etc. as more successful missions began running simultaneously. This harmonic development seemed to fit the evolution of the space program from its nationalistic origins to the more collegial and collaborative efforts underway today. I feel like I hit a nice sweet spot with this piece between something that’s listenable while still clearly being data-driven in a way that actually gives you some real insight (pun intended) into the narrative shape of Mars exploration. The initial missions are staccato and syncopated, building to the successful landing of the two Viking missions in 1975 which gives us our first sustained interval. After that success, it’s almost as if the human race needs to catch its breath before moving further, with a few missions here and there gradually building to a massive chord as more and more successful Mars orbiters, landers, and rovers begin operating simultaneously and for longer durations, capped by the blip of the anticipated launch of InSight on May 5 (which happily, did indeed occur, and successfully too). In the next post, I’ll break down my second attempt to make music from the timeline of Mars exploration, with a very different rhythmic and harmonic approach. Here’s a list of links to works cited in my recent talk “Storytelling in the Age of Divided Screens” at Gallaudet University. Thanks to the Motion Light Lab for inviting me!. Making music out of the data of interplanetary exploration. Here’s a list of links to works cited in my recent talk “Storytelling in the Age of Divided Screens” at Gallaudet University. I’m very happy to announce the launch of “Timeframing: The Art of Comics on Screens,” a new website that explores what comics have to teach us about creative communication in the age of screen media. To celebrate the launch of Upgrade Soul, here’s a screen shot of an eleven year old prototype I made that sets artwork from Will Eisner’s “The Treasure of Avenue ‘C’” (a story from New York: The Big City) in two dynamically resizable panels.